1. Grease a pan with butter of approximately 20 cm (8-inches) square. 2. Boil the milk, sugar, and syrup gently in a heavy saucepan, stirring continuously with a wooden spoon until the sugar has dissolved and the syrup melted completely. 3. Bring to the boil, cover and boil for 2 – 3 more minutes. 4. Remove cover from the pan and continue to boil until the temperature reaches 116°C/240°F. 5. Remove the pan from the heat and stand it in cold water until the temperature of the syrup falls to 43°C/110°F. 6. Add the peanut butter and vanilla to it and beat the mixture until it thickens and becomes paler. 7. Pour the fudge mixture into the pan and leave it undisturbed until it is just about set. 8. Pour the fudge into squares and leave until it sets completely. 9. 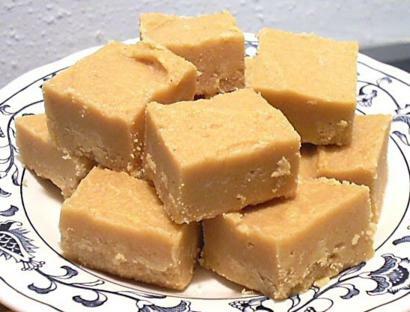 When set, cut or break the fudge into pieces. 10. It can stay upto 2 weeks.